Unroll dough; place on cookie sheet. Starting at center, press out dough into 14x10-inch rectangle; cut into 4 (7x5-inch) rectangles. Spoon 1/3 cup chicken mixture onto half of each rectangle, spreading to within 1/2 inch of edge. Sprinkle 2 tablespoons cheese over each. Fold dough in half over filling; press edges firmly with fork to seal. Prick tops with fork. Bake 9 to 12 minutes or until light brown. 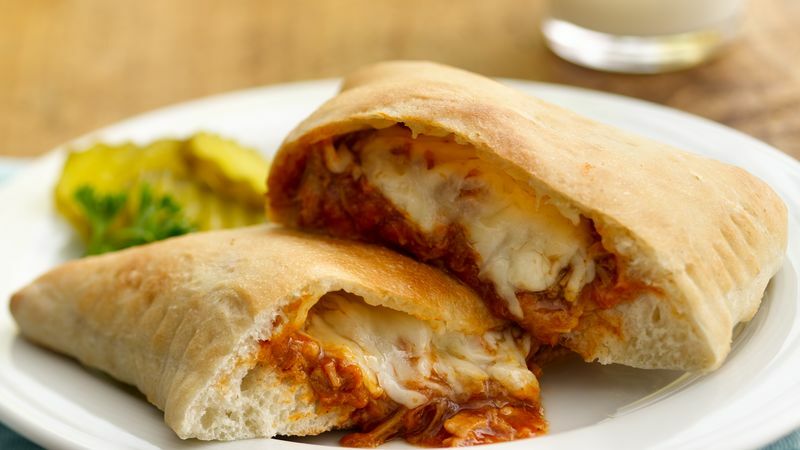 These calzones are perfect for a meal on the go. Simply wrap a baked calzone in foil to keep it warm while you're on the run.